Both these attributes make the SDI is an excellent complement and counterpoint to other personality assessments that participants may have done in the past. The SDI is also simple to complete, easy to understand and remember, and with its positive and compassionate frame, it’s easy for teams to embrace! We regularly use the assessment tool most commonly deployed in corporate settings, the Myers Briggs Type Indicator (MBTI). The MBTI is based on the personality theory of Carl Jung, which defined 16 personality types comprised of preferences for styles of perception and judgment. The MBTI provides participants with a common, widely recognized and understood vocabulary for expressing preferences. The Myers Briggs Type Indicator is a more complex tool than the SDI, and thus takes longer to present. Combining this tool with the hands-on exercises that PCFL uniquely uses can more quickly illuminate different preferences in action. MBTI is a valuable tool that can greatly assist teams of all sizes and diversity. Providing each team member with insight into their own preferences as well as their peers, can have an immediately positive effect on communication, relationships and results. We go beyond the traditional personality explanations and allow participants to experience a variety of personality types through active exercises. Several PCFL consultants are certified in Myers Briggs Type Indicator and we have had great success delivering this assessment to people and teams who have not experienced MBTI before! In response to client requests for a method to assess different facets of team performance before beginning a session with our facilitators, we created our own team performance assessment. Consisting of up to 16 customizable measures of team performance, this survey provides a good overview of where team members believe they perform well, and where team improvement can be made. Scores can indicate gaps in perceptions and provide a good starting point for crucial conversations. The survey questions can be customized to ensure relevancy to your organization and can be administered more than once to evaluate whether improvement occurs over time. While individual survey responses are anonymous, statistical data is provided to inform the team on scoring patterns (mean, mode, and standard deviation) to gauge team alignment and divergence. Foursight is an assessment tool designed to explore problem solving skills in individuals and groups. Are you a Clarifier? An Ideator? A Developer? An Implementer? The ability to understand and leverage your thinking style/s is the first step when working within a team. Knowing your colleagues’ strengths will allow understanding of which role they will naturally play on a team and in which areas they are likely to add the greatest impact. If you are continually bringing forth ideas, but never able to make them happen, or great at remembering details, but get overwhelmed when thinking of the big picture, this tool will bring some clarity to your strengths and those of your colleagues to form a well rounded, effective team. The Kraybill Conflict Style Inventory is a useful tool for gaining knowledge about our preferred method of engaging with conflict. Additionally, this inventory scores participants on their “storm shift”, showing how behaviour changes when under stress or the situation becomes more intense. We use this tool to help participants understand their own preferences for conflict navigation, become aware of alternate styles, and examine how communication is the key to setting new patterns for better relationships and results. Team development with Pacific Center for Leadership takes groups one step further than our team building activities into a longer, more focused day of conversations and activity. In collaboration with our clients we design a session of content supported by hands on experiences to ensure participants understand core concepts and have a chance to see the theory in action. Typically longer than our team building activities, team development sessions are one to three days in length. To allow participants the opportunity to better understand their strengths and contributions to their team, we use a number of personality-type inventories and/or team assessments to provide information and a common starting point for all. Based on the premise that a better understanding of your own behavioural preferences and underlying motivations will enable you to work more effectively with your team members, these tools allow participants to better articulate their natural strengths and show how diversity adds to overall team effectiveness. Along with assessment tools, we have developed materials to explore common themes essential to team performance: communication, change and transition, navigating conflict and building trust. We typically explore these themes through presentation of a current model or framework, followed by group discussion and other active learning methods. After the presentation of materials or a discussion of a concept, we usually move into an experiential learning activity, encouraging participants to be aware of the behaviours they choose and suggesting alternatives in order to shift patterns and open up new ways of working together. This is an excellent opportunity for insight and reflection. Our professional facilitators lead a debrief conversation after each activity and encourage the team to relate the experience back to their functioning in the workplace. Individual commitments and follow up steps are opening shared, increasing accountability to themselves and their team members. Our facilitators are licensed to deliver these inventories, and have created ways to animate the subject matter. We ensure these sessions are positively focused with the emphasis on how all types and preferences are essential to team success. If your organization uses another tool, or if you have previously completed an assessment and are interested in building off of the knowledge your team already has, we are happy to incorporate existing materials into our work with you. 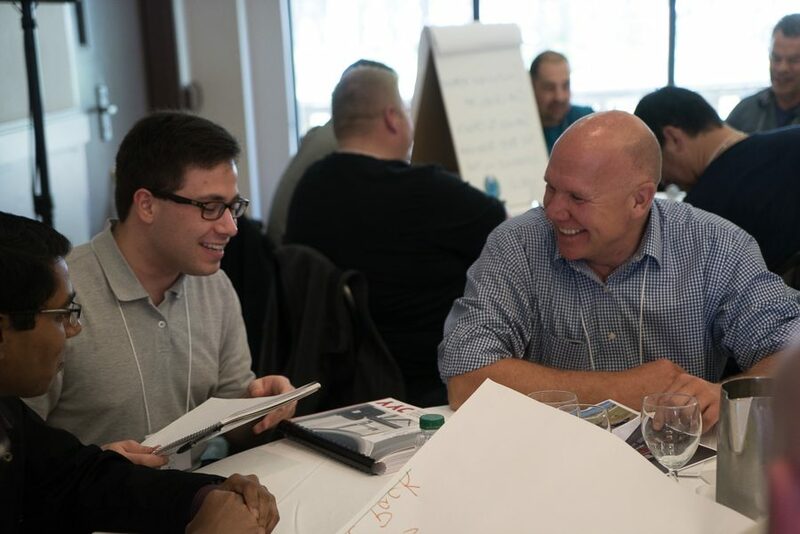 Pacific Center for Leadership has been helping organizations thrive for over 30 years, using our powerful and practical approach to develop better leaders, create better teams, and produce better results. Team building experiences contribute to employee engagement, reinforce collaborative company culture, and help organizations overcome changes and challenges. Pacific Center for Leadership © All rights reserved.